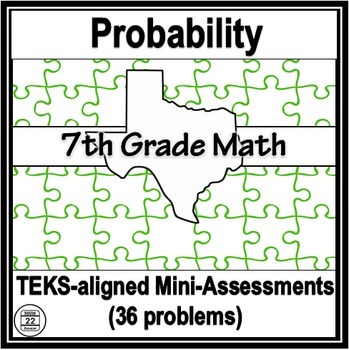 7th Grade Math TEKS Probability mini-assessments includes problems on experimental and theoretical probability. This set includes 9 assessments with 4 problems each aligned to the Seventh Grade TEKS. There are 36 total problems!!! Answer keys and a data form to track student progress are also available. These problems are great for math centers, bellringers, exit tickets, and other types of assessments and checks for understanding. They address seventh grade standards, but teachers can use them to prepare sixth grade for next school year and for eighth grade review. On the student data form, there is a section for interventions. 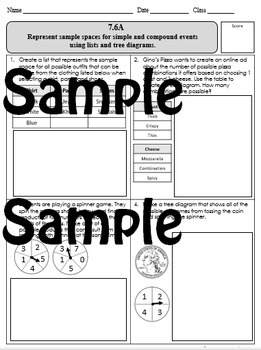 Teachers can use this section for students who need extra assistance to master number and operations. Each purchase of Four x Four Assessments: Probability Texas Edition is for individual use only. The individual licensee can make copies for classroom use for students only. Licensee may not upload this product to the Internet for any reason.